In this Pulitzer Prize winning novel, 11 year old Lucas Priest is talked into stealing his grandpa’s car by his family friend Boon Hogganbeck. One of the Priest family retainers manages to sneak into the car and comes along for the ride. The trio make their way to Memphis, where Boon has a girl he’d like to court. Along the way, they lose the car, gain a racehorse, and generally get in trouble. This is supposed to be one of Faulkner’s more light-hearted and easy-to-read books, and I agree with that assessment. Despite its serious topic, it has a subtle humor throughout. The plot tends to be pretty loose and easy to follow. The characters are strong and endearing. 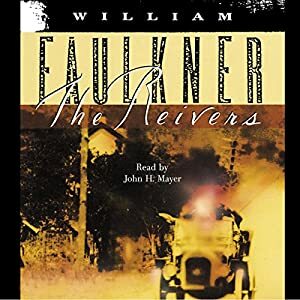 Overall, I found the book quite enjoyable and am pleased that I chose this Faulkner book to read, rather that one of his heavier books. I do want to read his heavier books, but sometimes it’s nice just to read something light-hearted by one of the best American authors. I'd actually never heard of this book until reading your review. I'm glad it was an enjoyable, light read 🙂 I definitely don't imagine Faulkner being light! Thanks for the commentary on this Rachel. I want to give this a try. I have only read Faulkner's As I Lay Dying. That book had a lot of humor in it too. There was is also much to recommend it. With that, I found it difficult on a lot of levels. Yeah, Faulkner's books are generally pretty heavy, even if they have humor. This one is hardly YA light, it still makes you think, but it's far from intimidating.